March is Yummy's Anniversary month! Happy 5th Anniversary YUMMY magazine! Yes, it's just been 5 years, yet it feels like an eternity. YUMMY says Hi this March with a fresh new look of YUMMY Magazine. With the introduction of new sections and columns, YUMMY puts the final touches on its makeover as the pages in the fifth anniversary special are revitalized and injected with a more energetic vibe to better enhance your reading and cooking experience. “It’s a new look, yes, but you’ll also see that we’ve upheld the YUMMY approach that has been appealing to you all these years. The recipes are still easy and friendly, the tips plentiful, and the ideas creative and inspiring,” says YUMMY editor-in-chief Becky Kho in her editor’s note. Quite interesting on this issue is YUMMY's annual food business features, where success stories of Filipino cooks and entrepreneurs have found their way to success with hard work and passion for their chosen field. These food entrepreneurs are indeed making a name for themselves and soon they will be a household name, we can all be proud of. Find out here on this month's issue on food entrepreneurs Katrina Ponce-Enrile of Delimondo, Mary Grace Dimacali of Café Mary Grace, and Peter Chen and Juliet Herrera of Serenitea on how they have made that big leap to entrepreneurship. Be inspired by their success stories and learn how you can turn your own fascination with food into a business. 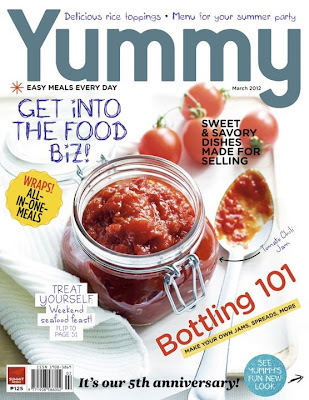 Plus, YUMMY gives you a primer on bottling, which covers preparing containers for long-term preserving and proper canning techniques. Learn also how you can make your own spreads, jams, and condiments, all in this month’s issue. The March issue of YUMMY, a fifth anniversary special, is available at newsstands, bookstores, and supermarkets nationwide. For more of YUMMY online, visit www.yummy.ph, become a fan on Facebook via Facebook.com/yummymagazine and follow them on Twitter via Twitter.com/yummyph.